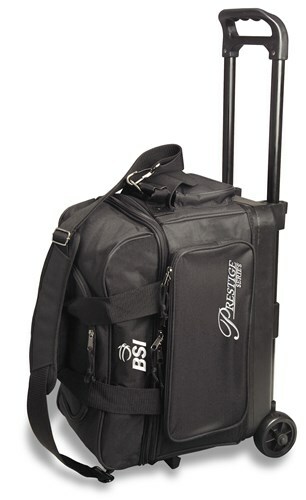 The Prestige Double Ball Roller bag line by Bowlers Superior (BSI) offers all of the features that a bowling bag needs. This bag is available in a variety of colors to match your style. A double ball bag that has a shoulder strap to carry if needed.Would be nice to have larger wheel on it. Hello! The bag will be made of Nylon. This bag does come with the shoulder strap? Hi. The shoulder strap is not included. What are the actual dimensions of the ball compartment ? and of the overall bag ? Hello! The BSI Prestige double roller is 17.5" inside and 23" overall length. Due to the time it takes to produce the BSI Prestige Double Ball Roller Black ball it will ship in immediately. We cannot ship this ball outside the United States.